March is the month RDs bring their message of good nutrition to the nation. 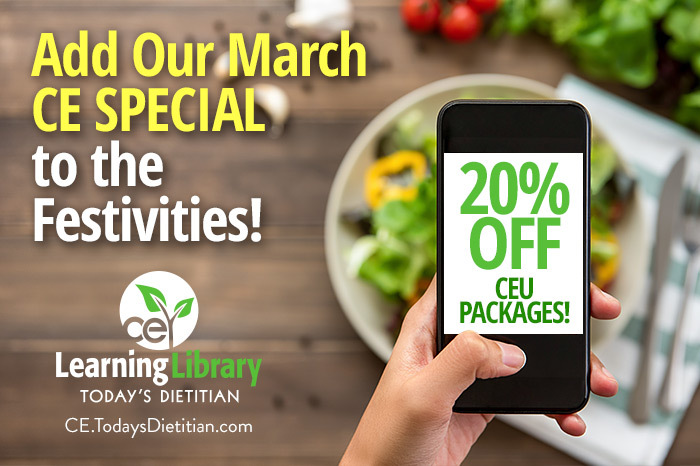 To celebrate nutrition and support the professionals who help us get and stay healthy, we're offering 20% off any of our CEU Packages all month long! Whether it's our 5-, 9-, or 12-packs of self-study courses or the Webinar 5-Pack, choose the package you want, place it in your cart, and use coupon code MARCHPACKS at checkout to get your 20% off. Celebrate your professional and personal commitment to nutrition education all month by visiting CE.TodaysDietitian.com to review our courses, webinars, and package options. This offer will end on Sunday, March 31, 2019, at 11:59 PM EDT.